What should I do for a work from home online business? There are 5 pages here of spell ideas. Also, the first three posts go through moderator approval. Please don't keep posting the same question because you don't see it. We see them in the moderator's queue. hi i hope this is the right place to put this! is there anything i can use to increase the amount of clients/students? i'm thinking of a sachet powder to dress it? look me over? steady work? i'm thinking of printing out a ton of fliers and keep it in a box (when i'm not putting them up) with the sachet powder on top. and before i use it to use a bit more sachet powder that ill sprinkle on top... but what happens when i lift it up and the sachet powder falls off... will the magic hold on to the paper? that's a concern of mine.. that the moment the powder's off it'll stop working..
maybe an oil that i can dot the 4 corners of each sheet just at the tips so it's not very visible? or just take a stack, put some oil on my finger and run it along the edges? Will burning incense in my shop be enough to bring in more customers or do I need to do more? Sometimes that is all that is needed. But, sometimes it isn't and you need more. it's difficult to predict the outcomes. BUT most people do more to insure complete success. Please can any one very spiritual help me out? I am a prophet of God and have an ultra- modern cathedral of 2,000 seats, but have suffered seriously in the area of numeric membership increase. I have done so many things and still not achieve my desired results. 1. What spell do i need to draw crowd of worshippers into my church? 2. How can i retain my members, so that they will stay as they come? 3. How can i multiply my church membership of 180 to thousands? 1) Spells of charisma and attraction will give you an edge, but first you must have a message to give, a tradition within which to work, and a program of social outreach that provides incentive to seek the Divine through your intermediation rather than elsewhere. Assuming that you do have both good news to bring and a program for improvement in this life as well as the afterlife, i would suggest that you start by cleansing the building and then move to using a combination of Attraction, Look Me Over, Blessing, and other holy oils or powders. Use the oils on wood or metal surfaces and the powders as a dust on papers and business cards. You can also scent your incense with a little of these attraction-type fragrances, in addition to regular Holy Oil. I happen to also like the scent of Special Oil No. 20 for sacred speces. It is a blend used for all manner of good things. Begin with Psalms 1 to send away bad parishioners and draw in good ones, Then move to Pslams 23 for general blessings. 2. Again, start with personal and social work -- give them tasks to do, a sense of mission and purpose beyond the prayers and forms of worship. A church with a building program, a choir training and performance program, a day care center, a food bank program, or a ministry for shut-ins and the elderly will draw very faithful attendance. Then, again, each of these will need business cards, and you will dress them with the powders of Attraction and Stay With Me and Return To Me. The latter two are often thought of as being used only when women want to keep a man, but they will keep a dog loyal or a congregation or store customers coming back too. 3. To increase your popularity, be sure you have a web page and a Facebook page, and dressed business cards to hand out, as described above. Then consider adding a youtube channel. Upload 3-minute cell phone videos showcasing the choir, the sermons, and some simple teachings from your heart. Upload a new one at least once a week, advertise it on your Facebook page, and keep a list of permanently archived links on your web page as well. This does not require a spell -- it is simple business practice. Next, create giveaways that people want to take home and that will remind them of their membership. Prayer cards are a good choice. Dress them with powders, as described above. If you hold spiritual type services (i don't know what type of church you have, so this may or may not be appropriate), consider candle services, flower services, or ribbon services in which each parishioner takes home something tangible. Also invest in church fans, prayer cloths, and other tangible goods. These can be conventional or unconventional in form. One of the best of these types of items i ever got was a reproduction of the "Widow's Mites," the two little coins that the poor woman gave at the temple (Mark 12:41-44, Luke 21:1-4). You can build a sermon around this concept, and the reproduction coins are readily available. Whatever things you distribute, those things will be dressed for your success as a minister and also for the continued interest and loyalty of your church members. many thanks dear catherine yronwode. may the Almighty God richly bless you in abundance, for taking out time to compose such a lenghten message of hope. i have used some anna riva products and some bottle candle spell works before. My church is very spiritual and prophetic, so i do some spiritual things. Though am based in Nigeria but currently in Orlando, Florida on a vacation. I have already ordered for the van van, steady work, attraction, lodestone and commanding spell kits a day before your reply came to me. Since you do not ship to my country, so i felt i should get those items now that am in the united states before leaving here shortly. Note: i dont know what you mean by Charisma spell? I have recently moved to a new province and need to get my massage business going. Other than the obvious word of mouth and advertising...I'm looking for something a little more. I provide massages and reiki. I use coconut oil as my main carrier oil.I'm curious if it would be "ok" to add any of the anointing oils to the massage oil? 1. The main idea I had was an anointing oil into my carrier oil to increase income ... not something I want to announce to my clients though. 2. Another idea would be to the more holistic and spiritual crowd I could mention adding anointing oil for let's say a troubled mind/stress where the client would know. 3. The last idea I had was to use one of the aroma misters where you fill with water and add a scented oil...but instead add an anointing oil. Is any of this doable? If so I'm open to ideas and advice! First, i would recommend that you read all 5 pages in this thread. There are some solid and practical ideas included for any kind of business. 1. Yes, any kind of money drawing oil can be added to a massage oil in very small amounts -- just a hint. This is common Crown of Success Oil, although not a money oil, is also used this way, as is Special Oil No. 20. 2.You could actually offer a selection of oils to add -- you would be surprised how many will choose money or love or healing for themselves. 3. Peace Water and other condition oil / perfume / water blends are traditionally used this way. If oil is floated on water, just be sure to shake up the bottle before you begin misting. I'm new here, and have lots to learn! I am looking for help on how to sell already existing paintings that I have created. Also looking for help on keeping the sales up for future paintings. I am an artist, and have a day job as a graphic artist, but my real passion is painting. I have sold several of my paintings which is always awesome, but have these remaining four that just don't sell. One generates a lot of interest, and has had two serious potential buyers, but just doesn't actually sell. The other three don't generate too much attention. I am thinking maybe some hoodoo might help in addition to the things I do to try and get the paintings out there (show in galleries, slash prices, do a little self promo on social media, etc). I eventually would like to make an abundant living just from creating and selling paintings and drawings, and that is something I would also like help on working towards. I know it doesn't happen overnight, but I have been in this for a bit now and would like to increase the odds with some mojo! There are 5 pages here with spell ideas. Please read through them first. Then, if you have any questions, please don't hesitate to ask us. I paint at home, so most of my business in painting is at home. I have my paintings in a permanent gallery space. Occasionally, paintings go out to other galleries. I also display and sell my work online via my website and social media sites like Facebook and instagram. Oil the paintings themselves with money drawing products. I want to purchase several items, but I don't want to go overly crazy with purchases either. I also want to keep this simple, but effective. Does what I've written sound ok? I feel like I have already learned a lot through reading through these pages, but at the same time it is a lot of information and I could please use a little specificity to if I have devised a good plan for myself, or if it needs some tweaking. Wow! You REALLY did some reading! Good for you! The answer is "yes" to everything (the oils can be mixed. The powders can be mixed)!! Where to keep the lodestone? What about where you keep your cash? Personally, I would designate a place to keep some cash. Or for the cash and checks to go to that designated place first. That's where I would keep the lodestone. How often or for how long would I burn the candles in my space of business? Is the Chinese Wash the wash of choice for this matter? Yes, Chinese Wash is great. Some people burn candles indefinitely. Some just burn once in awhile. For a business, I would burn one at least once a week. Great--thank you for your help! It has been a while since I last updated. I am still here and reading everything. My business has been hit by one competitor after the other but we hanged in there and survive. We still continue doing all the magickal conjure and I must say its like a daily routine for me. Now I just found out that one of my competitor has sold his business and the new owners are planning to still continue selling the stuff that the previous owner were selling plus selling the stuff which I am selling for the pass 15 months. These new owners have started bad mouthing me and my shop and even told some of my loyal customers that they will ruin my business till I close down. They have begun to sell the my items at their shop at a cheaper price, etc, etc. I am thinking of doing a freezer spell using lemon and vinegar with their photo in it. I was also thinking of hotfooting them. Any other ideas? Setting up a business is hard enough - long hours and hardwork. Trying to get a share of the pie and sustaining it as a every day task. I really don't need this from this new owners. Why can't they just sell the same stuff as the previous owner??? Why must ruin others? Thanks for a listening ear and for reading my post. Wow, how terrible. That is just so so bad. And TERRIBLE people. Just TERRIBLE!! My family business is grinding to a halt with rivals poaching our customers. We will have to make several members of staff redundant shortly as we are only just keeping our heads above water and paying the bills. Some of our major machinery is failing and will need replacing but we just don't have the money to do this. What can I do to make the customers flow back to us? We need a big injection of money to get equipment fixed and be able to make people redundant. I am trying all the usual mundane things ie special offers etc but it's not enough. We need a huge amount of financial energy flowing to us. Please read the 5 pages on tis thread first. After reading, if you have any questions, please don't hesitate o ask. I am a business to business sales person. I'm asked by distributors to go into businesses and sell products on their behalf to those business owners. I am paid per location I am able to secure. The products are all food products. Since the products are already manufactured and sealed I can't tamper with them. I also have no access to the distributors warehouse or to any of these businesses unattended. Recently I have found that many of the retailers are rude or unwilling to listen and without the sale I can't get paid. I am sometimes able to get business cards from the potential businesses. What supplies and what type of ritual can I do to ensure that I will be able to find and secure prosperous locations? And you could use their cards in a honey jar to sweeten them to you. I'm sorry to hear that your business is struggling. If you scroll up through this thread, you will find pages and pages of information that can help you with this situation. If you have any questions after that, feel free to let us know! What spell kit(s) would you recommend to gain more massage therapy clients? You could work the Money Drawing spell kit as well as use Look Me Over products on yourself so people will be drawn to you and want to spend money on your services. Hello, I am new to the site and would like some help. I've looked through different topics and could not find what I was looking for. I am not looking to do any type of spell work by myself but would like to order some candle work though the church. The situation I'm facing is this: I've had an online medical billing business for over 5 years. Its been successful for the first 3 years and then suddenly there was a huge drop in money. I've either lost clients due to relocation or medical offices shut down for whatever reason. I'm struggling with getting new clients, I've been advertising in every possible way and not one phone call. Its very frustrating because at this point Im loosing money and can't seem to even get one account. I would like to know which candles to order and whats the best way to get my business back up and bring in money. At this point, Im thinking of shutting it down because I have no clients. I'm very upset because I've worked very hard to get this business up and running. Please help! Thank you everyone in advance. Welcome to the Lucky Mojo forum. If you like, you're welcome to introduce yourself on the "introductions" forum. 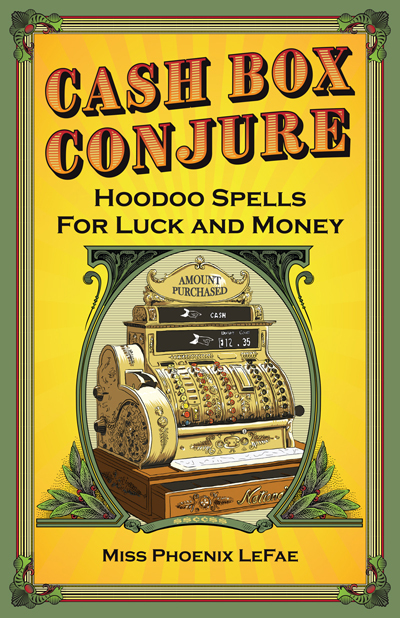 I'm sorry to hear that your business is struggling, but if you scroll up through the multiple pages of this thread, you'll find many, MANY ideas on how to turn that around with spellwork. If you have any questions after you read through all that, feel free to let us know. P.S. I see that you are new to the forum, but you should know that posting new topics is against forum rules. Next time you have a question, please find the thread that best fits with what you're asking (you can use the search box at the top right of the screen), and post your question at the end of it by clicking "post reply." Thanks! How are you all doing? Our business has been going quite stable. However, last week, odd things had happened. We found substances on the ground (someone might be hot-footing us ) and few days ago, someone smeared mud or something on both sides of our shop front. My business partner thinks someone is trying to close us down. This is so sad. I know about hot footing and laying tricks but smearing mud or something on the walls in something new to me. Any thoughts on that? ANYTHING could have been mixed into the mud. ANYTHING!! There's just no way that I could tell you what type of trick this is. I have a question relating to how to attract good employees. We have had nothing but problems with some businesses we own with employees stealing, not showing up for work, and a myriad of other issues. Our livelihood depends on us having customers who enjoy coming into our stores, but it just seems that we cannot get good, honest people to work for us. I was thinking about setting up some positive attraction spells, but we have eleven locations.... I'm sure I would need to do this at each location. Any ideas, thoughts, suggestions are welcome. I have moved your post to this thread. Although it's to draw customers, the spells are the same, only the petitions would be different. Take a look at the 5 pages here for spell ideas. Too bad you didn't come out for the festival. It was a blast! Thank you Miss Aida. I look forward to speaking with you again soon regarding other matters. Also, thank you for moving the post. For some reason I cannot create a new post, but can only reply. Nathen moved one for me before. Maybe I'm doing something wrong, so I'm going to take a further look. We no longer allow starting new topics. My husband inherited a small business (mom and pop grocery store) from his father(whose still living) with whom he shares the same name. His brother did some unscrupulous things prior to the business being given to my husband, that cause the local government to shut down them being able to accept certain payments. The majority of people that resides in that area are have little to no money and uses SNAP benefits for grocery.Since they are unable to use their cards at our location, most have to catch a bus to go to the grocery store. Due to his brother antics, the application that my husband submits for SNAP benefits is continously denied. What can I use to get the store thriving again. Other than that, it may just take a little time. Good luck to you in your work. I'm not sure if this is the right category, but when I searched garage sale I couldn't find anything. Basically, I'll be putting on a yard sale to bring in some additional income. I want it to be successful. Is there anything I can do to prepare the space and items for the sale. I was thinking about dusting some of the items, but should we mop our carport with any type of oils. Or put anything in the driveway where people have to walk over? I was thinking about doing a candle to attract people to the sale and then things on site to urge them to buy the items on display. I think that's a great idea! A simple trick would be to wash your sidewalk and driveway inward toward your house with powdered cinnamon and sugar in a bucket of water to attract sweet customers with money to spend. You could also add Money Drawing bath crystals to that wash water. If there are certain big ticket items you want to sell, dress them with a dot of Look Me Over oil to attract buyers' attention! l just want to ask, is there some spell or "job" that l could do for my friend business? l don't want him to know, that l doing something magically, but l want to draw more serious customers and increase his income from his work. If l need, l will buy powders, oils, candles etc., but l can't go to his place/business place to sprinkle it or doing something like that. That is a nice gesture on your part, to offer spiritual help to someone else's business. When working at a distance, as you noted, candle magic is usually selected as a simple method. I would recommend that you set a triangle of green or yellow candles around a photo or business card of the place of business, with your prayer or petition for your friend's success written around or behind it. Dress them with Prosperity and Money Drawing Oil (mixed) and light them. Use small candles, and burn them once a week for at least three weeks. While they burn, you may also light some incense, if you wish, either a stick incense such as Good Fortune, or a powder incense like Prosperity or a resin incense like Frankincense. Please I need help in getting people to buy from my online store. I have an online boutique that I advertise on Instagram.. I do get visitors on the site but no one seem to be ordering any thing from the website. Sometimes I just give up on selling online but then I have some strong passion in me for running an online store. Please what should I do in order to make some extra money online? I would use the attraction spell kit to bring more customers, and include success oil. I would also dust pamphlets you make and send with the package with attraction powder to draw them back. You can place these in brick and mortar locations for people to pick up and touch and get the powders on them and interested as well. Thanks for responding to my questions. I will order the attraction kit very soon and I might also have the LM missionaries burn some candles for me as well .. thanks and enjoy your weekend. I dont know why I didnt think of this book for you earlier but it dawned on me this morning. This is a recent book LM came out with and its all about money and business. IT will be a great help for you. Hello everyone! Please forgive me if I am posting in the wrong place! I am launching a business soon. And, I have an eye on some celebrities to send gifts to. I am doing the mundane work among which is contacting the ones I have an eye on, on Instagram. Without disclosing names, there is a specific celebrity whom I know would love my gift. What can I spirituality do to achieve my goal and get her attention? You would be interested in the product lines of Attraction and look me over, even influence to get them to notice you. A honey jar is great for any business, and there is a book by LM that is all about business success.